That escalated quickly! Before our tape machine was cold with a hot interview with one of the most in-demand writers in the business Jeff Lemire (All-New Hawkeye, Green Arrow, Sweet Tooth, Trillium, Swamp Thing) about his scorching hot new book with Dustin Nguyen (Lil’ Gotham, Detective Comics), Sony acquired the feature film rights to Descender! 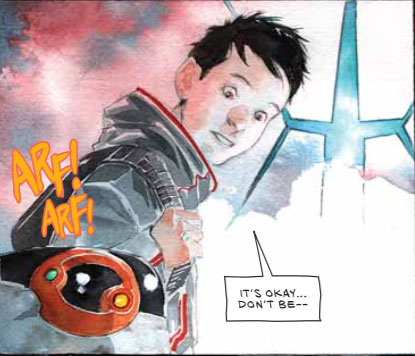 Published by Image Comics, Descender is a new science fiction comic appearing on shelves in March, and Jeff was kind enough to take the time to tell us about TIM-21, working with Dustin and creating a whole new universe. FOG! : Thanks for joining us, Jeff! We’re here to talk about Descender with Dustin Nguyen. What is an overview of the book for our readers out there? JEFF LEMIRE: Descender is a new monthly science fiction series for Image Comics that I am writing and Dustin Nguyen is drawing and painting. The high concept is that it centers on a young boy, a robot named TIM-21 in a universe that has outlawed all robots and androids. There is something very special about TIM that everyone seems to want a piece of. This is TIM’s adventure and quest to discover his own origin and the mystery surrounding his origin in a universe that hates and fears him, slowly building new friendships and companions as he jumps from planet to planet and gets closer to discovering the truth of who he is. And this really is TIM’s story, and I really enjoyed that in just the first issue. So this is an ongoing? I’ve interviewed Dustin before and I know that he loves to draw! His designs are so cool! Oh my goodness, he’s incredible. And he is a really great storyteller, which is amazing. He’s also really fast. On top of all that, in terms of designing things, he is a genius. If there is a robot or a piece of technology, he’ll design it in a 3-dimensional way, you could take it apart and see how it all fits together. He has a unique mind for doing that. Dustin is perfect for this book. I couldn’t be more thrilled to be working with him. Yeah, that is why the toy and sculpture guys love him. He gives them a design ready to go! When I first had the germ of the idea for Descender, he was the first guy I emailed. I knew that he could do that, not only designing the robots and technology but also the world building. I wanted something that can hop from planet to planet. This is a big universe, a big canvas. I knew he would give each planet its own personality, its own feel, so things couldn’t be repetitive. From issue to issue, story to story it is a completely different environment, with a completely different atmosphere and aesthetic. Dustin is delivering in a big way on that. Did you have a vision as well, did you send Dustin sketches of what you wanted the story to look like? No, I don’t send him sketches. When you work with someone like Dustin you just let him do his thing. The truth is, I had the very base idea for the story when I contacted Dustin. As I really developed the story and the world, I was developing it with him in mind. I was writing with his look, his designs in my head. It all happened at one time. It wasn’t a case of me having this thing conceived a certain way and getting him to execute it. That’s great, you are both immensely talented, and you can trust each other and see what comes back. This is the story of a boy, you’ve certainly done that before, with Sweet Tooth and Superboy. Is this your first time going into intergalactic space as a canvas? I did a book last year called Trillium (Vertigo), I drew that myself. It was a sci-fi book that took place in space, like this. That story was a bit smaller in scope. It mostly took place on one planet with one alien species. It was a good warmup for this, I spent a lot of time developing the culture of that alien race, the planet’s atmosphere and everything else. That was baby-steps toward Descender. I’m now developing a whole galaxy full of planets and alien races and the characters. Trillium was a primer. I went from there to this book—which is unlike anything else I’ve done in the past. Everything else I’ve done is grounded on Earth. Event the sci-fi stuff like Sweet Tooth was still in “our world”. This canvas is much, much bigger. I’m still approaching it as a big world but a small story focused on TIM and his quest. I’m telling an intimate story within a big canvas. Very cool, and you can draw from stories like Star Wars and Battlestar Galactica. The first couple of pages I was reminded of the planets in the Battlestar system. For sure, I love all those space operas, Star Wars, Star Trek and Battlestar. That stuff is obviously an influence and you can take from that when you can and make it your own as well. Being able to work with such a big canvas with an artist like Dustin, the story itself is kind of limitless. I have a very specific path in mind for the story. I have 24 issues completely plotted out, and an endpoint from there. The world that I’ve built out is so big, I can see multiple stories within it. Who knows how long or how big it could get? These stories are taking off, and being optioned. And here you are bringing your work to Image Comics. You’re an in-demand creator at the Big Two, and its great to see Dustin over at Image as well because I’m so impressed with what they put out. It’s just obvious, the stuff I’m reading is from Image. In my mind they are putting out some of the best comics right now. It’s almost a new Golden Age of creator owned comics happening there. All of my favorite comics and all of my favorite creators are working there. I couldn’t wait to get over to Image and to bring Dustin and be able to work with an artist like him is certainly fired me up creatively. For my first Image book, I wanted it to be something special. We’re really giving this one our all, and we hope that people find it and react to it the way we do. I think they will! I’m super impressed by the first issue and seeing how Dustin’s pages look and the story, there is a lot going on, and a lot of mystery to be revealed. I love it when I hear creators like yourself saying that you have it way plotted out to 24 issues! That’s how you work, pretty long form. It is a pretty big mythology and mystery that we are building, I knew we would need to have it all developed and figured out ahead of time. I didn’t want to introduce a bunch of cool stuff just to scramble as we go to have it all make sense. I spend a lot of time doing background development of the world and the story before I work on any scripts. I feel really confident I know where it is going. When you have that roadmap for a story this big, it allow you to experiment and do new things knowing you have that base to go back to. When you are working with Dustin, who as you say is a great storyteller. When you see pages coming back, is he influencing the overall work at all? Is it a collaboration? Do you take pivots here and there according to what the art is? Absolutely. There is one character he designed, the last page of issue #1. This was supposed to be a throwaway character, for this issue and the next. Great last page, by the way! Those are the kinds of pages that make me want more! One of those guys was just so damn cool, I knew he had to become a regular character. I started to try to think of ways that could happen, and that started a whole storyline where that group of characters become so integral to the whole thing, I don’t know why we didn’t think of it initially. That was all from one of Dustin’s designs. I love that. I love being inspired by the artist, having them give me something bigger and better than expected and give me new ideas story wise. It has been a joy working with him. It has been a very easy collaboration, we just seem to be on the same page about everything, and it has been awesome. He’s such a cool dude, and you are too. I’ve been a fan for a while and it has been a pleasure to talk to you!